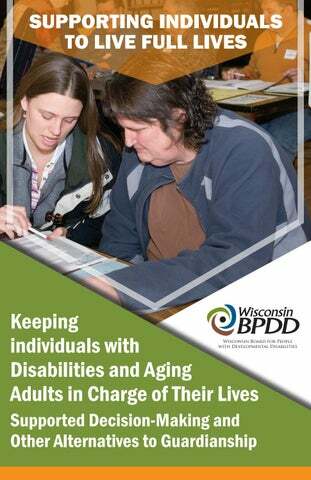 his guide provides important information about empowering individuals* with disabilities and aging adults to make informed decisions about their life that protect both their rights while ensuring their safety and privacy. Supported Decision-Making is a set of strategies that help individuals have more control over their life and future. It involves family and friends working together with individuals to support them in making complex decisions. This guide is for: individuals with disabilities, aging adults and family members and friends who support them; legal and education professionals; and service providers, including guardians or other supporters. Let’s create better supports so people with disabilities can lead more independent lives! *For the purpose of this publication, the term “individual” refers to an individual with a disabilities and/or an aging adult. Being able to make choices about your life is crucial for the independence and happiness of all people, including those with disabilities. Decision-making is a skill, and everyone needs practice. Just like all of us, people with disabilities continue to grow and gain experience throughout their lives. Regularly involving young people with disabilities in decision-making results in adults who are able to make informed decisions and direct their own lives. A Supported Decision-Making Agreement can help aging adults, experiencing changes in memory, cognition, and other abilities that may decline over a long period of time. Everyone has the right to make decisions about their own lives. Did you know that being able to make your own decisions leads to a higher quality of life? Studies show that people with disabilities who have more control of their lives and are more self-determined are: healthier more independent more likely to be employed at a higher-paying job better able to avoid and resist abuse When individuals with disabilities are less able to make their own choices, they are more likely to feel helpless, hopeless, passive, and are at greater risk of abuse. (Khemka, Hickson, & Reynolds, 2005; Wehmeyer, Kelchner, & Reynolds, 1996; Wehmeyer & Schwartz, 1998). Deci. “Intrinsic Motivation,” 208, 1975. People with intellectual disabilities who have more opportunities to make choices make better decisions. The more someone makes their own decisions, the better they can learn new skills, including problem-solving, goal-setting, and taking more responsibility. According to the 2010 Department of Health Services Handbook, Guardianship of Adults, “We all learn by making mistakes. If a person is denied the right to take risks, he or she is also denied the opportunity to learn and grow.” Making mistakes prepares us for future decision-making. There is dignity in being able to both succeed and fail, and to learn from our failures. Have the right to make decisions about things that affect their life. RTUNI Can learn new skills to be more PPO T O independent over time when they have the right supports. Have the right to choose: who will provide their decision-making support, what types of decisions they want support to make, and how this support will be provided. Learning is a lifelong process and does not end at age 18. People with disabilities can learn new skills to increase their independence throughout their lives. (Tymhuk, Andron and Rahber, 1998) WI Department of Health Services (DHS), Division of Long-term Care P-20460. “Guardianship of Adults,” June 2011. Supported Decision-Making recognizes a person’s abilities as well as their limitations. Supported Decision-Making is an alternative to guardianship through which individuals get help from trusted family members, friends and professionals to help them understand the situations and choices they face, so they can make their own decisions. Supported DecisionMaking enables individuals to ask for support where and when they need it. Powers of attorney, representative payees and simple release of information forms can also help families provide the needed supports and safeguards without going to court and imposing guardianship restrictions. Supported Decision-Making helps individuals learn how to make decisions about their lives. They choose the people they trust to help them understand complex information and make informed decisions about their medical, legal, financial, and other life matters. It’s how most people make decisions. When entering into a Supported Decision-Making agreement, those who can provide help in making decisions are called Supporters. Supporters agree to help explain information, answer questions, weigh options, and let others know about decisions that are made. They do not make the decisions. Supported Decision-Making Agreements: A Supported Decision-Making agreement includes a list of decisions the individuals wants assistance in making and identifies Supporters they trust to help them. Individuals and supporters can use existing sample Supported Decision-Making agreements or create a new one, making sure the following elements are included: Name and contact information, Why or what role the supporter plays, (ex: A supporter helps understand and figure out complex medical information) Specific information about what the supporter will do, (ex. Education supporter: Help decide what classes to take, etc.…) Signature area for the individual and supporters. A Supporter is available to help when needed. The individual chooses who they would like to support them, and determines when and for what reason they would like the assistance of a Supporter. A Supporter can: Help read complicated documents and explain their meaning. Attend meetings and help share questions or concerns. Help communicate the person’s decisions and preferences to others. Supported Decision-Making does not require one person to take on full Supporter responsibility. Multiple family members can be Supporters, increasing the breadth of the support network and making transitions easier as family members age and roles change. Supported Decision-Making can be an important part of the personcentered planning process, which focuses on outcomes driven by the individual and implemented through the support of family, trusted allies and professionals of the individual’s choosing to achieve those outcomes. Inviting Supporters to person-centered planning can help the discussion focused on the individual’s talents, gifts, and dreams for the future. We all want to improve our lives, not just maintain them. Person-centered planning and Supported Decision-Making can: Help an individual with share their hopes and dreams for the future and identify goals to improve quality of life. Identifies strategies and opportunities to help achieve a goal. Supported Decision-Making can help individuals stay in control of their own lives. Each person with a disability decides the amount and type of support he or she wants and needs. People with disabilities and aging adults need people they trust to support them in reaching their goals. Talk about goals and needed supports to achieve them. Think about an individualâ&#x20AC;&#x2122;s current abilities and areas where growth can occur. A support person should know the individual well and be able to understand and communicate with her or him. Bring the support team together to determine how team members will communicate. Supported Decision-Making agreements are as individual as the people using them. See sample resources. Once the Supported Decision-Making agreement is signed, share copies with doctors, financial institutions, schools, and others who are involved. How Does Wisconsin law Include Supported Decision-Making? Wisconsin Law formally recognizes Supported Decision-Making agreements as legal arrangements that allow persons to retain their right to make their own decisions, while also choosing trusted people (called Supporters) to help them gather and understand information, compare options, and communicate their decisions to others. People who can use Supported Decision-Making agreements include: people with intellectual/developmental disabilities; people with physical disabilities; people with mental health conditions; and people of any age with degenerative diseases or conditions that substantially limit one or more major life activities or the ability to provide self-care. Advantages to a Supported Decision-Making Agreement: Can be used for any decisions--housing, employment, health care, etc.-- the person wants support. Can be set up for free, and without going to court. The law includes standard elements that must be included in all Supported Decision-Making agreements. Can be easily updated, changed, or ended by the person. A person may have multiple agreements-- or identify more than one Supporter for certain kinds of decisions. Let teachers, doctors, bankers and other professionals know that a person has given a supporter consent to hear, receive, and communicate information with them. Important Supported Decision-Making agreements DO NOT restrict the personâ&#x20AC;&#x2122;s rights to make decisions; the person makes all their own decisions. Supported Decision-Making agreements DO NOT give supporters any new rights. Supporters do not make decisions for the person; their role is limited to helping gather information, compare options, and communicate the personâ&#x20AC;&#x2122;s decisions to others. Wis. Stats. Ch 52. Considering Alternatives to Guardianship There is a continuum of options for adults with disabilities (individuals) to get the support they need to live a full and productive life. Learning is a lifelong process and does not end at age 18. People with disabilities can learn new skills to increase their independence throughout their lives. Alternatives to guardianship may provide the right supports for individuals to live full lives while helping families reach safety and other goals. This can be a stressful time for families as well. Aging family members who experience a loss of decision-making skills, either temporarily or permanently, can often cause conflict within a family. Finding the right supports such as Supported Decision-Making or other alternatives can be a relief to families as they can share in the responsibilities rather than assigning sole responsibility (of guardianship) to one person. Important Considerations: Limited and full guardianships restrict or remove entirely the person’s right to make decisions and give the guardian responsibility for making decisions on the person’s behalf. Establishing and declaring in court that a person is “incompetent” is painful for all involved because it emphasizes the person’s limitations, rather than his or her strengths. Having decisions made by someone else reduces self-confidence and the ability to develop decision-making skills. Overly restrictive guardianships can limit the individual’s independence, cost families and the court system, are difficult to change, and can result in over reliance on paid supports. The ward is at greater risk of abuse and exploitation by others, especially when the ward is unaware of the rights they retain and is inexperienced in asserting that their rights and preferences should be honored. Guardianship does NOT protect a person from abuse or neglect. Guardianship does NOT guarantee safety. Family members and others involved in the individual’s life often overestimate the security that guardianship can provide, fail to look to other forms of support that may provide better protection of both safety and rights, and fail to consider the benefits of risk-taking, in terms of the learning opportunity for the person in setting goals, trying new things, and learning from failures. “I would rather be exposed to the inconveniences of too much liberty than to those attending too small a degree of it.” –Thomas Jefferson Autistic Self-Advocacy Network (ASAN). The Right to Make Choices: International Laws and Decision-Making by People with Disabilities, 2016. DHS, 2011. Many families feel pressured into pursuing guardianship to retain access to medical or school records and to try to reduce the risk of victimization. To provide support at meetings: As adults, individuals with disabilities have the right to choose who is invited to meetings with service providers. Access to information can be as simple as a signed release to attend an IEP, employment services, or a medical appointment. Ask the school, DVR counselor, medical professional for a release. A release gives those named on the form permission to attend meetings and speak to professionals involved. Allows the friend or family member to make end of life decisions when the individual is incapacitated. Free forms are available on-line or from a health care provider. Requires 2 signatures for each check. Form is available at the bank. A Representative Payee helps manage a bank account: sign checks and receive information from the bank. The “rep payee” makes reports and is accountable for all funds in the account. Form is available from the social security office. https://www.ssa.gov/payee/. Allows a friend or family member to help make financial decisions. Free forms are available on line. Managed by a trustee. Funds must be used to benefit the individual. Can be set up through a bank or through WISPACT https://www.wispact.org/content/wispact-trusts. Ginger’s foster parents taught her how to make responsible decisions and how to ask for help if needed. At age 18, Ginger’s Mom became her representative payee, but not her guardian, to help her manage her Social Security benefits. 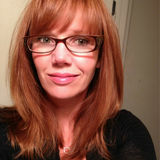 Her parents have both passed away, but every day Ginger uses the skills they taught her to make decisions at work and at home in her own apartment. She has become a skilled self-advocate, supporting others to make both big and small decisions in their lives. When Ginger needs health care advice, she consults her siblings. For financial questions, she asks her boss, and for social networking and other everyday decisions, she turns to her friends in her local People First chapter. Josh’s Mom is his guardian, and they use Supported Decision-Making to gather all the information Josh needs to make important financial and healthcare decisions. For the everyday decisions that Josh makes, he turns to his support broker, his roommate and friends, and family members to help him look at his options, set priorities, and make the decision that is best for him. Josh works in the community at a Nursing and Rehabilitation Facility and attends movies and Packer games with friends. He also has support from his friends in his local People First chapter.